Algae in the aquarium is a double edged sword. Sometimes it can be useful - as a food source for invertebrates and vegetarian fish - whilst at other times it can be a pollutant. Understanding how different kinds of algae function in the aquarium is essential to maintaining a healthy ecosystem and a beautiful looking tank. Green algae doesn't cause water quality problems in the aquarium - in fact it works just like other plants, performing a helpful role in the nitrogen cycle. However, it can create problems for your plants by growing on their leaves so that they're unable to photosynthesise, sometimes causing them to die. It can also cause aesthetic problems, obscuring the aquarium glass. Contrary to popular belief, algae is not just one indistinguishable green mass. There are several different species which commonly grow within the aquarium. Green Spot Algae - Probably the most common type of algae found in aquariums, this stuff starts out as little green dots on the glass or stones, but it can go on to colonise large areas. It's difficult for algae-eating fish to remove and may need to be scraped off with a razor blade. Green Hair Algae -This algae will sometimes bloom if poor filtration results in an excess of organic waste in the water. Lots of fish like to eat it and it's fairly easy to remove, but it can reproduce fast and become a serious problem. 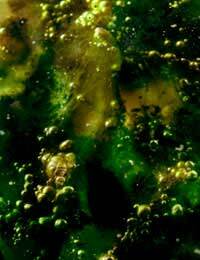 Green Water Algae - This floating alga turns the water a cloudy green. Strong mechanical filtration can sometimes remove it, but the best option is to reduce waste levels and so stop feeding it. It makes a good food for fry. Black Brush Algae - This dark furry-looking algae grows on plants and gravel and is very destructive and difficult to get rid of. The Siamese algae eater is the only fish which will eat it. Blue-Green Algae -Though it resembles one, growing in thick sheets, this is not a true algae but, rather, a colony of bacteria which can poison your aquarium water. It indicates poor water conditions and must be got rid of urgently. Many vegetarian fish, and even some omnivores, enjoy eating algae, which can be highly nutritious and provide extra roughage in their diets. Some, like plecos, thrive on it, eating almost nothing else. If you don't have much algae growing naturally in your tank, you may need to supplement the diets of fish like these with commercially prepared spirulina algae discs. As well as providing a direct source of food, algae can help fish by sustaining the small crustaceans and zooplankton on which some of them live. A few fish, like damsel fish, actually cultivate small gardens of algae to provide them with food sources of this type. The best way to limit the growth of algae in your tank is to present it with an inhospitable environment. This is difficult if you're using strong lights to aid plant growth and if you have a lot of fish producing waste which algae can use. The key is to keep your aquarium well planted, so that there are no left-over nitrates for algae to use, and to keep it well filtered, reducing the level of organic waste present in the water. You can buy commercial preparations for reducing the level of phosphate in the water. Reduce the use of plant fertiliser (if, indeed, you really need to use any) and try to feed your fish a bit less. Carry out regular water changes to improve your water quality. The best way to get rid of algae which has established itself is to employ suitable fish who will enjoy eating it. If this is not possible, or if your algae-eating fish are overwhelmed, try scraping it off surfaces with a razor blade or (in the case of acrylic tanks) with a piece of plastic. Don't clean such tools by just shaking them into the water - you need to get the algae right out of the aquarium, or it will re-attach itself. Algae management in the aquarium can seem like a nightmare, but, once you've got your nitrogen cycle under control, it's really quite simple. Patient effort will be rewarded with crystal clear water and an aquarium which is a joy to look at. @Newy - it may be excess phosphates, which is one cause of leaves turning brown to black then dying. @bob - Have you checked whether it could be Black Beard Algae or Black Brush Algae maybe?